We look forward to serving your dermatology needs. Patients who have visited our clinic in the past can book a follow-up appointment by contacting our office at 780-428-5554. New patients are always welcome too! We are in a 3-storey blue and grey metallic building (the second building behind the TD Canada Trust bank). 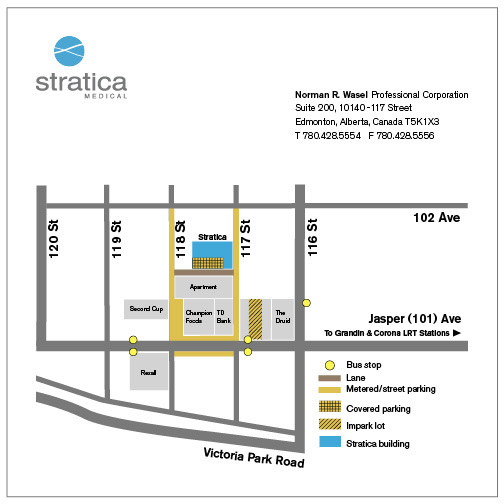 We are located on major transit routes, and 8 blocks from the LRT (Corona Station). There is free patient parking along the south side of our building with access from the lane, as well as paid parking in the lot just west of our building with access to the lot from 118 Street or from the lane.